The NFL sent a memo to all thirty-two teams today warning of fines, suspensions and loss of draft picks if the league determines that players are faking injuries during games. 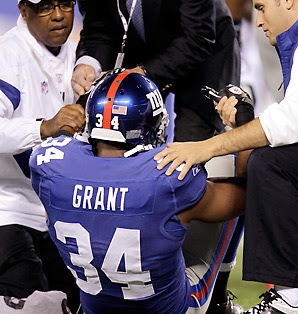 This coming after there was speculation that New York Giants safety Deon Grant faked a knee injury against the St. Louis Rams during Monday night's contest. Rams quarterback Sam Bradford said it was obvious the Giants were just buying time with St. Louis running a no-huddle offense. "They couldn't get subbed, they couldn't line up," he said. "Someone said, 'Someone go down, someone go down,' so someone just went down and grabbed a cramp." "I could see if I was walking and fell. When you see after I made that tackle and bang my knee on that play, you see me bending my knee as I am walking. Justin Tuck is walking behind me and saying, 'D don't run off the field. Just go down.' As I am walking, they line up, and knowing that I can't get back in my position because of the injury, I went down." Had he attempted to get off the field, it could have left New York a defender short when the ball was snapped. Of course, the Giants could have just called a timeout. That's something teams might wanna think about doing in the future. I honestly don't see what the NFL can do about this. There's no real way to know if a guy is faking or not. They may have sent out a memo, but I don't see anything changing. Guys have always faked injuries. No league memo or anything else for that matter is going to stop players and teams from doing it. Theres no way the league can actually enforce what their threatening. No way of really knowing if guys are faking or not.